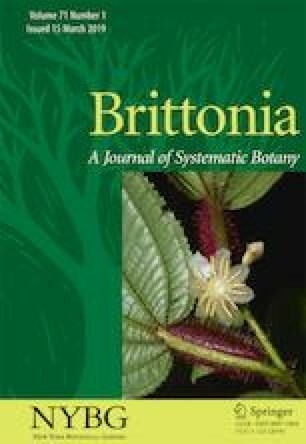 A taxonomic treatment, based on herbarium study and field observations, is presented for the Brazilian species of Myriocladus (Poaceae, tribe Bambuseae, subtribe Arthrostylidiinae), a genus of woody bamboos restricted to geographically isolated uplands of the Pantepui region of Brazil, Venezuela, and Guyana. Of the 12 accepted species of Myriocladus, five are recorded from Brazil, of which four also occur in Venezuela. One species, M. caburaiensis, is known from a single collection from Brazilian territory near the frontier with Guyana and is described herein for the first time. We also provide a key to distinguish the five Brazilian species and illustrations of each. This paper is part of the first author’s Master’s thesis in the joint Master’s Degree in Programa de Pós-graduação em Ciências Biológicas–Botânica Tropical at the Museu Paraense Emílio Goeldi and the Universidade Federal Rural da Amazônia. This study was financed in part by the Coordenação de Aperfeiçoamento de Pessoal de Nível Superior - Brasil (CAPES)–Finance Code 001. Funding from the National Science Foundation (DEB-1456232, PI: B. Torke) for a six-month long research internship at the New York Botanical Garden made it possible for the first author to study collections at NY and other herbaria in the United States. Grant 401526-2014-3 from the Conselho Nacional de Desenvolvimento Científico e Tecnológico (CNPq) of Brazil provided funding for field trips. We are indebted to Alex Pinheiro for the excellent illustrations of Myriocladus and the curatorial staff of the following herbaria for facilitating access to their specimens: A, CEN, F, GH, HUFES, IAN, INPA, MG, MO, NY, UB and US. We also thank Dr. Emmet Judziewicz and an anonymous reviewer for their critical reading of and suggestions on the manuscript. Shirasuna, R. T. 2015. Myriocladus. In: Lista de espécies da flora do Brasil. Jardim Botânico do Rio de Janeiro. http://www.floradobrasil.jbrj.gov.br/jabot/floradobrasil/FB86877 (Searched 9 April 2018). Thiers, B. 2018. Index Herbariorum: A global directory of public herbaria and associated staff. New York Botanical Garden’s Virtual Herbarium. http://sweetgum.nybg.org/science/ih/. (Searched 16 August 2018).